As my students begin introducing themselves and writing their reading autobiographies, I am enjoying the glimpse into their lives. Photos with family and pets and friends show me smiling faces, tell me about favorite people and places, bring the flat name on a page to life. 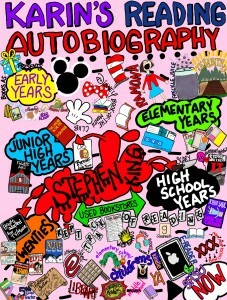 Next up for the YA class is the reading autobiography. I created a Padlet to show them a little something about y reading life. Karin Perry did a cool sketch note she permitted me to share. This early assignment gives us so much insight into the reading lives of our students and emphasizes some of the things we already know about how we come to love books and reading. We look forward to getting to know more about our students. They say a picture is worth a thousand words, and in this case, that holds true. A few sentences and a couple of photos tells me much more than all the other assignments for the courses ever could. As I scanned social media late this afternoon, I saw photos from Donalyn Miller's granddaughter's birthday, saw cardboard cake sliced for Mr. Schu's birthday, saw photos of Colby's kids reading to one another. I know Colby and John and Donalyn already, but those snapshots deepen not only what I know but provide me with more personal connections to folks I do not see FTF very often. One of the things I miss about online courses is the FTF experiences. At least these short introductions are providing me a bit of the human touch. Side note: if you are not following Karin Perry's odyssey in sketchnoting on Facebook, you should take a glimpse. I am in absolute awe (when I am not green with envy).